Dried apricots are gaining worldwide popularity owing to their nutritional content. They contain long chain fatty acids and contain various vitamins and thus, aid in prevention of many diseases. Apricots are considered to be one of the healthiest fruits as they are rich in nutrients, such as carbohydrates, proteins, fats, fibers, vitamins and minerals. In addition, they also contain vitamin A, C, K and B complex and reasonable quantities of organic acids, such as citric acid and malic acid. Recent advancements in the food and nutrition sector have shifted the consumer preference towards nutraceutical rich food products. In stone fruits, dried apricots occupy a distinct position as they provide multiple health benefits and hold significant functional food potential. In addition, published literature appreciates the number of total flavonoids and phenolic acids in dried apricots, which add extra nutritional value and more value to it as a functional food. In the global dried fruit market, the demand for dried apricots is increasing at a moderate rate from the food, bakery and confectionaries industry. Within the food industry, the demand for dried apricots is increasing from the snacks and ready-to-cook food sector. In the global market, majority demand for dried apricots comes from North America and Europe and the Middle East and African region is the world’s largest producer of dried apricots in the global dried fruit market. According to the data from the International Nut & Dried Fruit, the countries which hold major share in the production of dried apricots are Turkey, Iran, Uzbekistan, China and Afghanistan, all together produces 86% of the total global dried apricot. Due to increase in demand for dried apricots, it is anticipated that there would be higher returns for investors in near future. The global market is witnessing increasing demand for food products that not only fulfill the basic nutrient requirement but also play a pivotal role in the prevention of diseases and have curing properties. The food components which are fulfilling this demand are mostly phytochemicals, among them, phenolic compounds are considered as very important anti-oxidants. In this context, dried apricots can be considered as a functional food as they are rich in certain biologically active phytochemicals and have been used as folk medicine for ages now. According to many sources, peoples of the Himalayan region and China have been using dried apricots as a home remedy for centuries now. The folk lore describes dried apricots as anthelmintic, antispasmodic, expectorant, antipyretic, ophthalmic, laxative, antiseptic, demulcent, emetic, tonic and vulnerary. Dried apricots and apricot snacks are slightly more expensive than related dried fruit snacks, such as chips, bars and other bakery products. Increasing disposable income has allowed customers to make discretionary purchase of high-cost dried fruit products. Therefore, higher disposable capita earnings will give an upward push to the dried apricots market. Dried apricots are full of nutrients and energy. They are rich in minerals and vitamins and can be added to tonics and snacks. Dried fruits are high in calories and have high sugar content (more than 60%), and hence, are great energy boosters. Dried apricots are also gaining popularity among sports players, campers, etc., as energy-boosters to gain instant energy. Athletes are shifting to the use of dried fruits as an instant energy source instead of artificial sweeteners due to rising health concerns. Consumption of dry fruits as evening snacks or morning breakfast is a growing trend, which will directly increase the consumption of dried apricots as snacks owing to its good taste and vibrant flavor. On the other hand, factors, such as changing lifestyle and growing awareness about the benefits of eating right among consumers, are leading to an increase in demand for healthy snacks. Dried apricots are natural and rich in vitamins, fiber, and minerals, thus, are becoming a popular choice as snacks and in ready-to-cook products. The dried apricots industry will be affected by the expected growth in demand for premium lines of dried apricots which are appealing to consumers looking for a better product containing high nutrition content and significant functional potential. Various manufacturers of premium dried apricot products use different captivating advertisements to evoke a sense of authenticity in potential customers. The sales of premium products is currently mainstream in Europe and Latin America. Premium 'selected' versions target consumers who are willing to pay more for high-quality ingredients and better dried apricots products. The proposed market report of TMR on the global dried apricots market evaluates opportunities in the current market and provides updates and insights corresponding to different segments involved in the global dried apricots market over the forecast period 2018–2026. The global dried apricots market report further exhibits the estimated data for 2018, and forecast data up to 2026 in terms of value (US$ Mn) and volume (MT). In terms of value, the dried apricots market is anticipated to increase at a CAGR of 5.3% during the forecast period. The present study exhibits the trends and market dynamics of the dried apricots market in five major regions - North America, Latin America, Europe, Asia Pacific, and the Middle East and Africa. The report also includes the study of current issues with consumers and various future opportunities for the dried apricots market. The report explores the global dried apricots market for the period 2018–2026. The primary objective of the report is to provide insights into key developments in the market that are consistently supporting the transformation of global businesses that are associated with dried apricots. It is very important to consider that, in an ever-wavering economy, we provide the estimated (Y-o-Y) year-on-year growth rate in addition to the Compound Annual Growth Rate (CAGR) for the overall forecast, to better understand the analysis and evaluation of the global dried apricots market, and to discover equitable opportunities. Yet another key feature of this report is that the estimation of the global dried apricots market and the corresponding revenue forecast is carried out in terms of absolute dollar opportunity. This is usually not prioritized while forecasting overall market numbers. Absolute dollar opportunity analysis is very essential in evaluating the degree of opportunity that a provider can observe to execute, as well as to contrast the potential resources from a sales perspective in the global dried apricots market. The report starts with an elaborate executive summary, and the market definition of various segmentations that are included and their respective shares in the global dried apricots market. The report further incorporates the major macroeconomic factors that have an effect on the growth of the dried apricots market. 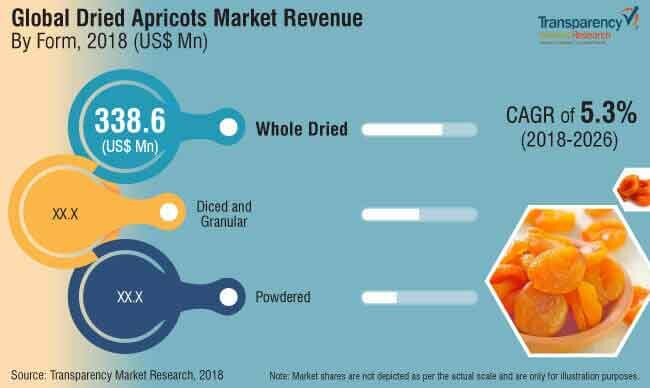 The report also highlights the various market dynamics, which includes drivers, restraints, opportunities, and trends in the global dried apricots market. The report further underlines the study of the present issues with industrial processing and opportunities for the dried apricots market. It also encompasses value chain analysis that provides a structural view of overall profitability from the manufacturers to the end users of the dried apricots market. In order to provide users with a clear view of the global dried apricots market, we have exhibited a competitive analysis of key market players and their strategic expansions. The competitive dashboard presents a detailed comparison of dried apricots manufacturers on valuable parameters, such as key product offerings, total revenue, key developments, and key strategies. The study intensifies the global dried apricots market attractiveness analysis by nature, form, end user, distribution channel, and region. To evaluate the overall market size of dried apricots, the report considers various fundamental aspects based on secondary research. Furthermore, it emphasizes quantitative evaluation, such as market shares by nature, form, end user, distribution channel, region and other qualitative data from primary respondents, which have been consolidated to arrive at clear and accurate market estimations. The forecast presented in the dried apricots market report arrives at the total revenue being generated and the expected revenue contribution in the future by the global dried apricots market. The detailed profiles of companies that manufacture dried apricots are included in the report to analyze their developmental strategies, key product offerings, and recent developments, as they have a significant role in the global dried apricots market. Major market players covered in the dried apricots market report are Fruits of Turkey, Purcell Mountain Frams, B & R Farms, LLC, King Apricot, JAB Dried Fruit Products (Pty) Ltd, Bergin Fruit and Nut Company Inc., Sun-Maid Growers of California, Traina Foods, Inc., Sunbeam Foods Pty Ltd., Red River Foods Incorporated and others.